Play off of your kids interests. We ask our kids what they are interested in learning about or if they have a skill they might be interested in trying out. i.e. cooking, sewing, blogging. Sometimes they aren’t sure or maybe you have an idea of something that you would like them to learn(like reading). Our family has a problem of trying to decide and to implement all of the possibilities. We are interested in so many different topics. One way that we come up with all of the different things that we can learn about is visiting our library which is our families favorite place to visit. This leads up to the next coming points. Love to read. I was one of those kids that never loved to read. After I started to have children of my own it was my goal to foster in my children a love for reading, even before I realized that I would one day homeschool. So… how do you get your kids to love to read? Number ONE:Read to them!!! Offer them a variety of books. Take them to the library. Read to them. Let them see you reading. Read to them. Wait until they have established an enjoyment for reading before you start to (gently) require them to read certain books. Read aloud to them. 🙂 As for reading instruction(teaching a child to read) start out slow, simple, and try to make it fun. We use a book called “Alpha Phonics” and we use “Bob Books” to teach our kids to read…so far it has worked out great. Keep it simple and do not let frustration seep into your reading time!!! 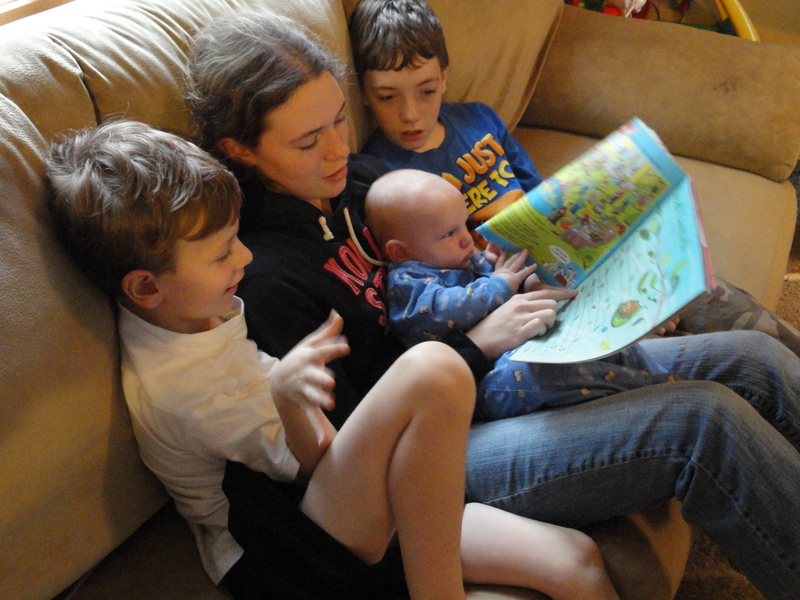 Big sis and brothers reading Highlights together. Incentives can be a tool to encourage the kids to work diligently. The trip to the library is great incentive at our house. Other incentives could include some extra time for their special interests. Don’t leave them in the dark. Tell them that you want them to love to learn. Talk to them about it! Don’t Push too hard. If you are getting a lot of resistance do not give in to the temptation to push harder. Choose your battles wisely. If you or the child gets frustrated or is struggling in a certain area let it go for a while. Trying to fight through something that your child may not be ready to undertake is only going to bring frustration and will not foster the love for learning that you desire your child to embrace. If a certain subject area is really getting my child down, I will not hesitate to put it away for a while and try again later. It is like potty training. Sometimes they just aren’t ready…that is okay. Don’t push it. Take breaks! This reinforces “Don’t push too hard”. Don’t feel bad taking breaks. A Joyful Home- strive to have a joyful home environment. A lot of times this starts with the parents. There is a saying: “If mama ain’t happy, ain’t nobody happy” 🙂 . It is so much easier to retain information when you enjoy learning.